Liquid water appears to flow from some steep, relatively warm slopes on the Martian surface. Features known as recurring slope lineae (RSL) were first identified in 2011in images taken by the High Resolution Imaging Science Experiment (HiRISE) camera aboard the Mars Reconnaissance Orbiter (MRO). The dark streaks, which appear seasonally, were confirmed to be signs of salty water running on the surface of the planet. "If this is correct, then RSL on Mars may represent the surface expression of a far more significant ongoing drainage system on steep slopes in the mid-latitudes," a research team member told Space.com in 2012. "The detection of hydrated salts on these slopes means that water plays a vital role in the formation of these streaks," the study's lead author, Lujendra Ojha, of the Georgia Institute of Technology in Atlanta, said in a statement. Vast deposits of water appear to be trapped within the ice caps at the north and south poles of the planet. Each summer, as temperatures increase, the caps shrink slightly as their contents skip straight from solid to gas form, but in the winter, cooler temperatures cause them to grow to latitudes as low as 45 degrees, or halfway to the equator. The caps are an average of 2 miles (3 kilometers) thick and, if completely melted, could cover the Martian surface with about 18 feet (5.6 meters) of water. Frozen water also lies beneath the surface. Scientists discovered a slab of ice as large as California and Texas combined in the region between the equator and north pole of the Red Planet. The presence of subsurface water has long been suspected but required the appearance of strange layered craters to confirm. Other regions of the planet may contain frozen water, as well. Some high-latitude regions seem to boast patterned ground-shapes that may have formed as permafrost in the soil freezes and thaws over time. The European Space Agency's Mars Express spacecraft captured images of sheets of ice in the cooler, shadowed bottoms of craters, which suggests that liquid water can pool under appropriate conditions. Other craters identified by NASA's Mars Reconnaissance Orbiter show similar pooling. 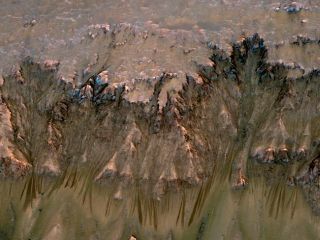 Evidence for water on Mars first came to light in 2000, with the appearance of gullies that suggested a liquid origin. Their formation has been hotly debated over the ensuing years. But not everyone thinks that Mars contains water today. New research reveals that RSL may actually have formed by granular flows formed by the movement of sand and dust. "We've thought of RSL as possible liquid water flows, but the slopes are more like what we expect for dry sand," lead author Colin Dundas said in a statement. "This new understanding of RLS supports other evidence that shows that Mars today is very dry." That idea may have been washed away by the recent discovery of a possible subsurface lake near the Martian South Pole. Researchers made a big splash when they announced that Mars might be hiding a lake beneath its southern pole. The European Mars Express spacecraft used its Mars Advanced Radar for Subsurface and Ionosphere Sounding (MARSIS) to detect the proposed water. Ground-penetrating radar sent radar pulses to the surface, then timed how long it took for them to be reflected. The properties of the subsurface layers affect how long it takes for the beams to return. MARSIS' investigation revealed that the Martian south pole is composed of multiple layers of ice and dust to a depth of about nearly 1 mile (1.5 kilometers) spread over a 124-mile-wide (200 km) region. "This subsurface anomaly on Mars has radar properties matching water or water-rich sediments," Roberto Orosei, principal investigator of the MARSIS experiment and lead author of the new research, said in a statement. MARSIS also revealed the presence of a subsurface lake among the pockets. According to the radar echoes, the lake is no more than 12.5 miles (20 km) across, buried nearly a mile beneath the surface. The scientists aren't certain of the lake's depth, but they have confirmed that it is at least 3 feet (1 meter) deep. According to the researchers, the lake must have salt to keep from freezing. "This is just one small study area; it is an exciting prospect to think there could be more of these underground pockets of water elsewhere, yet to be discovered," Orosei said. Not all researchers are as certain about the presence of liquid water. "I think it's a very, very persuasive argument, but it's not a conclusive or definitive argument," Steve Clifford, a Mars researcher at the Planetary Science Institute in Arizona, told Space.com. "There's always the possibility that conditions that we haven't foreseen exist at the base of the cap and are responsible for this bright reflection." More than three decades ago, Clifford proposed that Mars could harbor liquid water beneath its polar caps in the same way that Earth does. On Earth, lakes beneath the Antarctic and Greenland ice sheets are created when heat from within the planets melt the glaciers in patches. Clifford told Space.com that a similar scenario could happen beneath the Martian polar ice caps. "The bright spot seen in the MARSIS data is an unusual feature and extremely intriguing," Jim Green, NASA's chief scientist, said in a statement. "It definitely warrants further study. Additional lines of evidence should be pursued to test the interpretation." "We hope to use other instruments to study it further in the future," Green said. At the center of this view of an area of mid-latitude northern Mars, a fresh crater about 6 meters (20 feet) in diameter holds an exposure of bright material, blue in this false-color image. The early '90s kicked off a slew of Mars missions. Scientists were flooded with a wealth of information about Mars. Three NASA orbiters and one sent by the European Space Agency studied the planet from above, mapping the surface and analyzing the minerals below. Some detected the presence of minerals, indicating the presence of water. Other data measured enough subsurface ice to fill Lake Michigan twice. They found evidence that ancient hot springs once existed on the surface and sustained precipitation once fell in some areas. And they found patches of ice within some of the deeper craters. Impact craters offer a view of the interior of the red planet. Using the ESA's Mars Express and NASA's Mars Reconnaissance Orbiter, scientists were able to study rocks ejected from the planet's interior, finding minerals that suggested the presence of water. "Water circulation occurred several kilometers deep in the crust some 3.7 billion years ago," Nicolas Mangold, of the University of Nantes in France, said in a statement. But orbiters weren't the only objects launched toward Mars. NASA's Curiosity rover is the fifth robot to land on the surface of the Red Planet in the last 15 years. Pathfinder, Phoenix, Spirit and Opportunity all took detailed measurements of the planet; all but Phoenix traveled across the surface collecting a treasure trove of information. The probes dug into the ground, examining rocks and performing experiments. In 2008, Phoenix turned up small chunks of bright material that disappeared after four days, leading scientists to surmise that they were pieces of water ice. The lander went on to detect water vapor in a sample it collected and analyzed, confirming the presence of frozen water on the red planet. Spirit and Opportunity, the twin rovers, found traces of water enclosed in rock. In a shining example of a problem becoming a solution, a broken wheel on Spirit scraped into the top of the Martian surface, revealing a layer beneath rich in silica that had most likely formed in the presence of water. Curiosity has found yet more evidence of water flowing on ancient Mars. The 1-ton rover rolled through an ancient stream bed shortly after touching down in August 2012, and it has examined a number of rocks that were exposed to liquid water billions of years ago. Mars missions aren't the only way to search for water on Mars. Scientists studying rocks ejected from the Red Planet found signs that water lay beneath the surface in the past. "While robotic missions to Mars continue to shed light on the planet's history, the only samples from Mars available for study on Earth are Martian meteorites," lead author Lauren White, of the JPL, said in a statement. "On Earth, we can utilize multiple analytical techniques to take a more in-depth look at meteorites and shed light on the history of Mars." The flatter northern plains of Mars may once have hosted an ocean, or possibly, as the planet cycled through dry periods, two. The more recent body of water would likely have only been temporary, seeping into the ground, evaporating, or freezing in less than a million years, scientists say. Riverbeds and gullies indicate that water ran, at least briefly, across the surface of Mars. A hundred times more water may have flowed annually through a large channel system known as Marte Vallis than passes through the Mississippi River each year, according to estimates. The gullies themselves are smaller, likely forming during brief torrential rainstorms when fast-moving water could have carved them across the land. Curiosity found indications that at least one region of Mars, Mount Sharp, was built by sediments deposited in a lake bed millions of years ago, suggesting large pools existed on the planet for significant time periods. "If our hypothesis for Mount Sharp holds up, it challenges the notion that warm and wet conditions were transient, local, or only underground on Mars," Curiosity deputy project scientist Ashwin Vasavada of NASA's Jet Propulsion Laboratory (JPL) said in a statement. On Earth, the land around rivers and lakes is wetter, made up of mud and clays. Such deposits exist on Mars as well, trapping water and indicating where larger bodies may have once existed. Water on Mars may be doing something more than sitting pretty. A new study reveals that when the liquid boils, thanks to low pressures, it can make the sand levitate. "Sediment levitation must therefore be considered when evaluating the formation of recent and present-day Martian mass wasting features, as much less water may be required to form such features than previously thought," the researchers wrote in their study, which was published in the journal Nature Communications. Water may seem like a very common element to those of us stuck on Earth, but it has great value. In addition to understanding how Mars may have changed and developed over time, scientists hope that finding water will help them to find something even more valuable — life, either past or present. Only Earth is known to host life, and life on our planet requires water. Though life could conceivably evolve without relying on this precious liquid, scientists can only work with what they know. Thus they hope that locating water on celestial bodies such as Mars will lead to finding evidence for life. With this in mind, NASA developed a strategy for exploring the Red Planet that takes as its mantra "follow the water." Recent orbiters, landers and rovers sent to Mars were designed to search for water, rather than life, in the hopes of finding environments where life could have thrived. That has changed, however, with the flood of evidence these robots have returned. Curiosity determined that Mars could indeed have supported microbial life in the ancient past, and the next NASA rover — a car-size robot based heavily on Curiosity's basic design — will blast off in 2020 to look for evidence of past Red Planet life. Follow Nola Taylor Redd at @NolaTRedd, Facebook or Google+. Follow us at @Spacedotcom, Facebook or Google+.